The MD.450 Ouragan (Hurricane) was designed by engineers Deplant, Cabriere and Rouault as the first fighter developed by Avions Marcel Dassault and the first jet fighter of French design to attain series production. The Ouragan began full-scale de-velopment after the end of World War II, a prototype flying for the first time on 28 February 1949 powered by a 2267kg Rolls-Royce Nene Mk 102. The second and third following on 20 July and 2 June. Twelve (later increased to 14) pre-series aircraft were followed by 350 production Ouragans. Of the production Ouragans, the first 50 were completed to an interim standard as MD.450As, subsequent aircraft embodying modifications and equipment changes as MD.450Bs. Changes included replacement of the Nene 102 by the lighter Nene 104B of 2300kg. Armament was four 20mm cannon which could be augmented by 16 Matra T-10 rockets externally. The 352 produced for the Armêe de l’Air, main-ly serving as a fighter-bomber, were superceeded by the Dassault Mystêre IVA in the later 1950s. 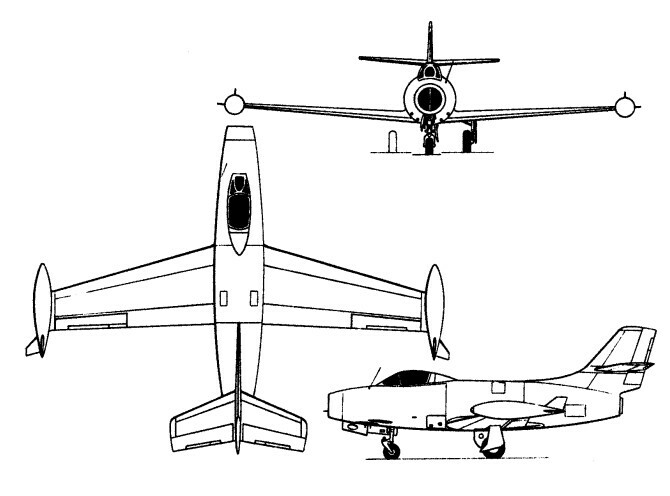 An Indian Air Force order for 71 MD.450Bs was placed on 25 July 1953, these having the Nene 105A of 2350kg and British Mk V versions of the French 20mm Hispano-Suiza cannon. Named Toofani in Indian service (the Hindi equivalent of Ouragan), the Dassault fighter remained in first-line use until 1967, a further 33 having been procured from the Armee de l'Air (including 20 unused machines from storage) in March 1957. Twenty-four MD.450BS were ordered by Israel in January 1955, these being supplied from Armee de l'Air stocks in the following October-November and a further 46 (including one MD.450A) being delivered subsequently. Eighteen ex-Israeli Ouragans were delivered to El Salvador in 1975, remaining in service into the late 1980s.